The map below is telling but about as predictable as it gets; Top-level economic earners have to be concentrated in states like New York (and bedroom communities in NJ and CT) and California during their peak earning years in order to work on Wall St. and in tech/venture capital. 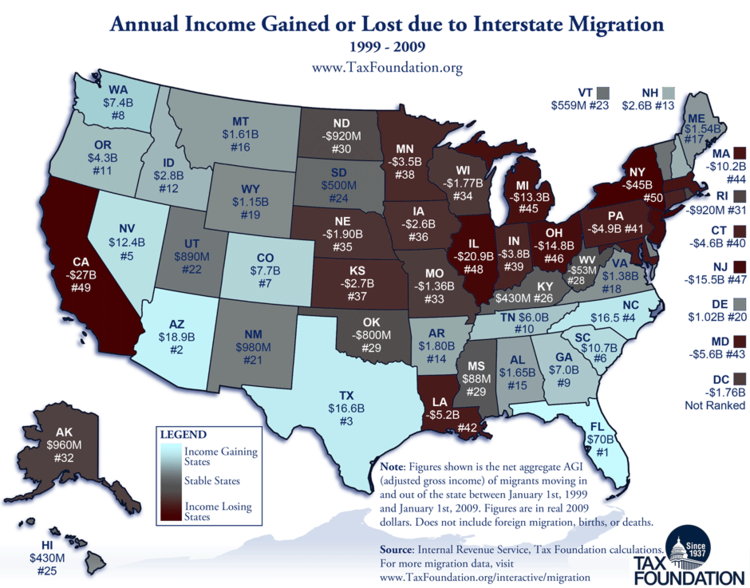 But, being the money-motivated people they are, they’re fleeing as soon as possible to states with no income tax (and, unless you’re leaving CA, almost invariably better weather compared to the Northeast) such as Florida, Arizona, Texas, and Nevada. What does a truly bankrupt state look like? Is it even possible? Per the author, no: “Technically, I don’t think bankruptcy is even possible since there’s no provision for such a step in federal law.” So what, then? Total anarchy? No cops, no courts? Of course not. If single banks are too big to fail, states clearly qualify for bottomless bailout status. So long as people keep accepting that worthless debt-issued fiat dollar as payment, that is. Because the federal government has nothing else to offer for payment, excepting I.O.U.s it can never repay. Tax-motivated migration may put fiscally irresponsible states at risk of financial collapse. Which will be first? One of the main lessons we learn is that high-earning taxpayers tend to migrate from states with onerous tax burdens and they tend to land in places where there is no state income tax.